According to the Barna Group nearly half of all Americans who accept Jesus Christ as their Saviour do so before reaching the age of 13 (43%). 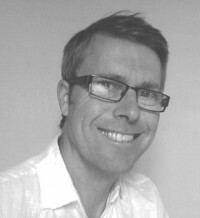 Someone dedicated to reaching this age group in the UK using humour and cartoons is author and illustrator, Andy Robb. His 50 Weirdest Bible Stories book picked up Children's Book of the Year 2010 (u12) from the UK Christian book industry and one copy of each of The 50 Weirdest Bible Stories was placed into every one of the UK's 4,500 libraries last year. He is also the creator and writer of the bumbling clergyman Derek The Cleric, the vicar at St Cliff's. Emily Graves caught up with him to find out more. Emily: Please start by telling us a bit about yourself. Andy: Regarding being an artist that tracks back to when I was a kid. I've always drawn and you couldn't stop me; I always had a pencil in one hand and always enjoyed being an illustrator. I went to art school, which was a natural thing because otherwise I probably would have been bored out of my mind doing something else. I was also brought up with a family that loved books. I loved comics and I loved books and somehow the two sort of melded together. I went to art school and trained, but I had my sights set on being a cartoonist. I also I wanted to be rich and famous but that was a shallow goal. I set up in London and I've worked over the years for loads of ad agencies and design groups and worked on children's books and comics and things like that and all the things I set out to do originally. Emily: You started off in children's books? Emily: But more specifically actually stories, which are about the Bible? Andy: I became a Christian before my kids were born and God gave me a real heart for communicating the things of God to kids, which to be honest I never really had. Although I'd done kids books for other publishers, I'd never had a real heart or anything like that for kids and communicating the things of God to kids, so I started looking for a way to do that. I started with books which were more in the Nick Butterworth style, because my kids were little and that's the sort of thing I knew, but it wasn't my forte. I was targeting seven to 11 year olds, that's the area I felt comfortable with. I started developing books and ideas for that shortly after. 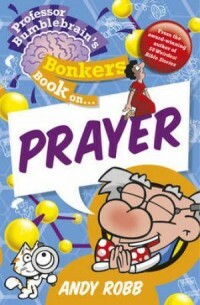 I did have some success and my first book was called What Shall We Pray About and it was a big board book and the idea was to encourage children to pray. There were lots of pictures and there were loads of ideas to stimulate prayer. My kids featured on the front cover of it so did my wife and myself. Emily: Did you feel that there was a gap in the market? Andy: I'm not sure I thought there was a gap in the market, but I had a real heart as I say for reaching kids. I guess my kids had a number of books that they looked at, that had been really nicely designed and well produced, but they went through a few pages and then just put them down. I thought, why aren't they reading them? Then I stumbled across the Horrible Histories. With a publisher we decided to develop a range of books called the Boring Bible, which showed the Bible isn't boring, but had loads of facts, loads of fun and loads of cartoons; but actually in a way was using that style of bringing alive the Bible to the kids and they really took off. I enjoyed that; kids seemed to like that, so I found my niche. It's a bit by default rather than design; but as I say lots of humour, lots of illustration and cartoons, but also lots of facts. I'm a truth man as well, so I didn't want to dilute any of the truth of the gospel in the process, which is easy to do. Emily: What would you say is one of your favourite stories in the Bible? Andy: I'm always asked that. I occasionally go to schools to talk to kids and they'll always ask me to pick one out and I read it to them. I'm not sure I have a favourite, but I often pick out a story from one of my books called The Fifty Goriest Bible Stories and it's about a guy who goes to his enemy and he plunges his sword, if I remember rightly, into his enemy's belly and it gets lost in his blubber. It's probably not my favourite Bible story, but it's probably the kids. Emily: So tell us about the different series of books you've done. Andy: I've done the Boring Bible books, which was 12 books and is still in print. Since then my publisher has been CWR and they've been brilliant over the years. We've done quite a lot with them. We've done a series of books called the 50's series, like the 50 Craziest, the 50 Weirdest and 50 Goriest. We would have done eight, there's two more out this year of those and they've been really successful. In fact one of them won children's book of the year a couple of years ago. They really bring alive Bible stories. It's retelling the story with a cartoon, but with a hook to get the kids into reading the Bible as well and kids have liked it. It gives them the Bible, but also helps and directs them to the Bible themselves. That series is probably complete when the next two come out. We've also had a series called Professor Bumblebrain and the Bonkers books on Jesus, creation, Bible heroes, God, prayer and parables. They are really bringing alive certain themes in the Bible; for instance God is a bit of a wacky crazy character, who talks very bluntly and humorously and directly to the kids, with loads of cartoons. It delivers all the 'meat' in an edible way to kids, so they absorb all the truth about God as much as you can fit into 128 pages, but making it enjoyable at the same time. They're definitely not trying to be worthy or earnest. You answer questions along the way and second-guess children, but you want them to be entertaining and enjoyable as well; there's no point, as I said earlier, if they're not going to read them. Professor Bumblebrain has also got some comics to go with it. We produce some comics about Christmas and Easter and Halloween as well.